You feel you are essentially out-of-step with conventional religious ideas. You have difficulty accepting those "absolute truths" and rigid dogmas you were told you had to believe. And, you're probably a little tired of being made to feel guilty because you have honest questions. If these sentiments express where you're coming from, relax. You are not alone. A large percentage of those 61 million non church/synagogue-going adults feel the way you do. Is there a religious/spiritual community for people like you? Yes. We're the Unitarian Universalists. We've been around for a long time, and we've attracted some of the most significant and independent thinkers in history: Thomas Jefferson, Charles Darwin, Oliver Wendell Holmes, Susan B. Anthony, Dorothea Dix, Henry Thoreau, Clara Barton, Isaac Newton, Ralph Waldo Emerson, Adlai Stevenson, Dr. Linus Pauling, Elliot Richardson, Robert Fulghum... and many others. Our religious approach is based on independent, free exploration. We don't feel that any person, any book or any institution should tell you what you must think. You and you alone are responsible for your religious well-being. 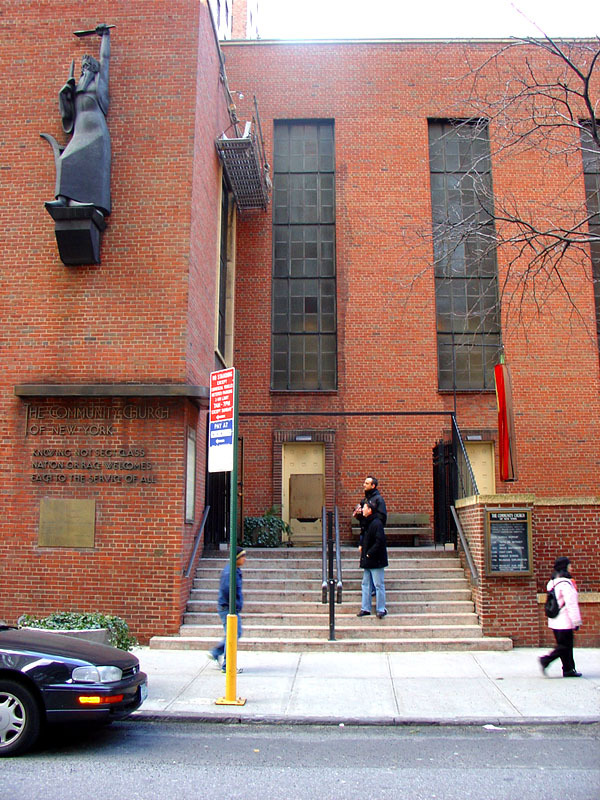 What should I expect when I attend a Unitarian Universalist service? Frankly, that will vary from congregation to congregation. Essentially, though, you'll find a congenial and supportive climate that is intellectually free and spiritually exciting, where you are encouraged to reach out and grow, not curl up and accept. We have no doctrines and dogma that you must accept. We believe that "truth" is ever-evolving, so we remain open to new scientific revelations and philosophical insights. We are more concerned with the essential goodness of people, not some inherent sinfulness. We are more concerned with the here-and-now, rather than a hereafter. Does this sound like the kind of religious home you've been looking for? What will I find at Community? You will find a friendly, diverse community honoring a variety of religious traditions. Our congregation includes those from diverse races, cultures and faith backgrounds: Jewish, Roman Catholic, Protestant, Unitarian Universalist and others. We are young, old, and in-between; straight, gay, and bisexual; single, married, in committed relationships, and divorced; unemployed, working, retired, struggling, and well-off; various races and diverse theological beliefs. Extremely Interesting! Caring! Committed! Seeking! And Finding! Together. A Community! !